The San Diego artist we are honored to feature today is a print-maker of undeniable taste. Gregory Bada, pronounced "bayda", was turned onto print-making when an instructor recognized his great drawing skill and suggested that it would translate well to the medium. 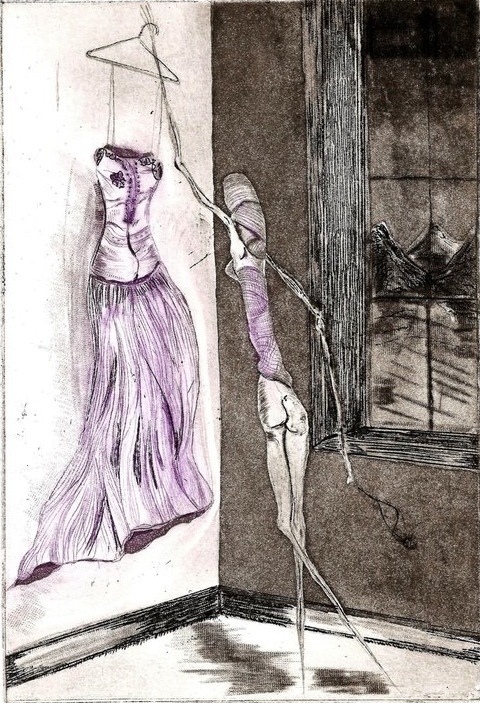 Since then, Bada has explored different types of print-making, concentrating primarily on intaglio. For reference, intaglio refers to a family of printing techniques all of which involve cutting an image into a metal plate, then applying ink into the grooves, from where the ink is transferred onto paper. The benefit of the medium is the ability to produce multiple copies of the same image. 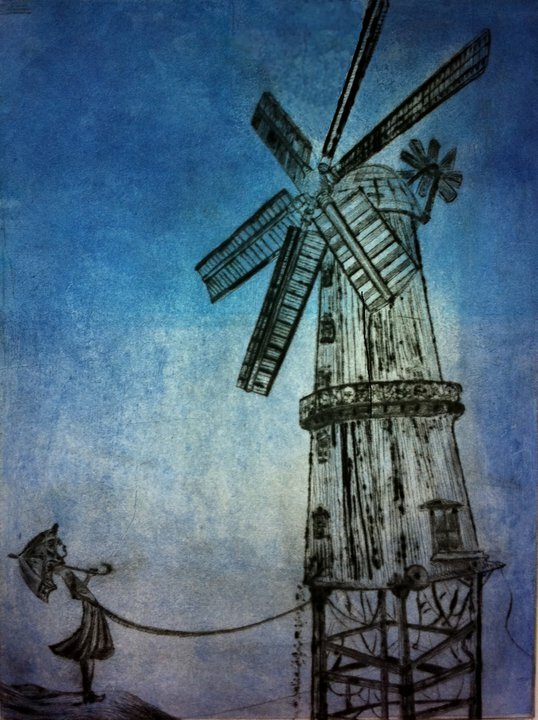 "My intaglio prints are all done using centuries-old techniques. I take no short-cuts," Bada has said. 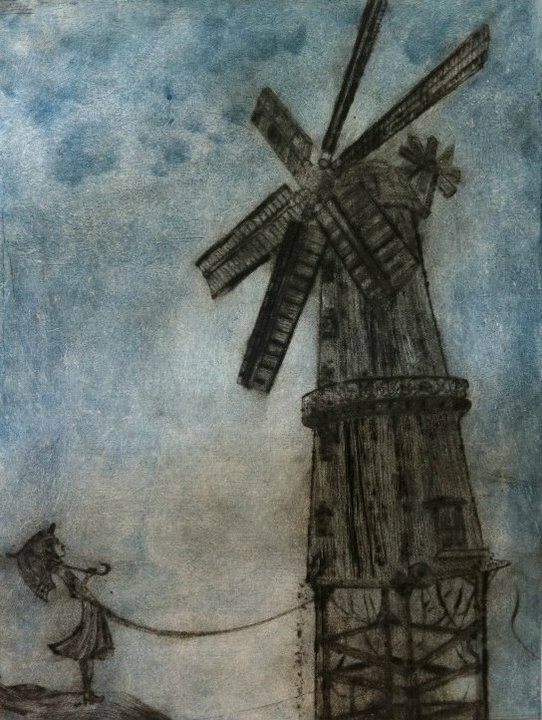 "I begin with a clean zinc plate whereupon I etch an image and utilize other techniques such as acid and aquatint to add line and value which can sometimes take weeks. Ink is then applied to the etched plate and pulled though a hand-cranked printing roller press onto special water soaked paper. Each series is completely unique and numbered for authenticity." Since the intaglio medium is different than drawing and painting, where the image is applied directly from the artist's hand onto the presentation surface, part of Bada's accomplishment is his ability to produce fine lines, details, and moods, even though the direct impact of his hand is removed. Bada's etched lines often tend to exhibit a rigidness that evokes such varying moods as elegance, antiquity, and surreality. In both Flying Away and The Windmill, Bada's old-fashioned look is in full effect. 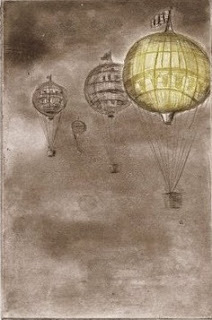 It's not so much that he has depicted hot-air balloons that gives Flying Away its dated look, but it's the fact that he chose to depict the more round balloons of the 1800s, and the fact that his etched monochrome clouds seem done in just the style of an 1800s hot-air exhibition guide. The Windmill, however, isn't content with inhabiting only the realm of nostalgia. The simple addition of a tied rope translates suspensefully as "when the old mill goes down, so does the young woman", a detail which might lead us to see the rope as representing the bond between body and spirit. In Starting the Day, Bada depicts a bare-bottomed woman reaching for her day's outfit. 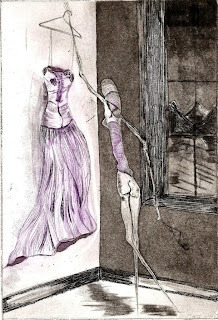 Her elongated figure stands in striking contrast to the billowy gown on the hanger. The contrast also of the lit room against the dark mountain scene through the window glass is a subtle complexity that enlivens the scene. The image leaves us yearning to not only see the woman's face, but also, in a refreshing twist on the voyeuristic leanings of much art, to see her clothed. Bada cites the intaglio work of Francisco Goya, Kathe Kollwitz, James Whistler, and Otto Dix as that which he is inspired by. But there also seems to be a kinship with Odilon Redon whose etchings play along similarly surrealistic lines. Bada's distinct lines and imagined scenes, however, keep him on his own unique thematic and visual ground. "People always ask me what my art means or signifies," Bada has said. "I always have the same response: it came from a dream, of which parts came true." 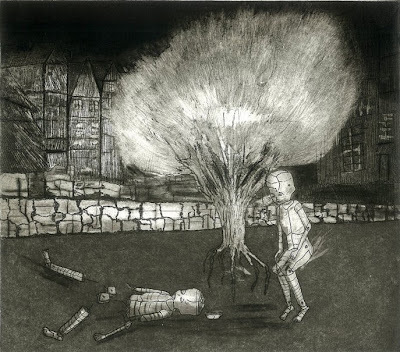 In Broken Boy, the dynamic tree with its glowing burst of a top, its intriguingly visible roots, and the detailed town backdrop almost overshadow the central drama: what is either an artist's dummy or a robot encounters a dead one-of-its-kind. But aren't they both inanimate characters anyway? What does it really mean to be dead, or to be broken? The piece serves in some regard as a work of loss and grieving, but it isn't lost in blind despair. Rather it has one eye on the rest of the world, the natural splendor, as well as the splendor made by humanity, and the freedom to roam around through all of it and to breathe it in, while we still have the opportunity. "I see inspiration for imagery all around me everyday," Bada has said. "I bounce around between things that are highly organic and things that are highly mechanical. I find a strange yet wonderful harmony in mixing [the two]. There are so many different methods, so many roads that you can go down to achieve different results with whatever image you're trying to create. And deciding which process I'm going to use to bring that image to life is an exciting proposition for me. It always keeps it fresh." It certainly does! Who knew such an old technique was being given such great new life and right here in town! Well, as long as it continues to be a joyous and prosperous process for him, we wish Gregory Bada a long succession of dreams in the hope that he will continue to share them with us in his prints. We wish this because the trademark timelessness of his scenes is a welcome reprieve from the hustle and bustle of our individiual situations.